Just like a computer software program, checklists can be useful, but if there is a flaw in the system, they can be a disaster. It started in 1935 when Boeing designed a plane that was far better than any of its competitors. The problem was that the plane, eventually named the B-17, was much too complex for even the most experienced pilots. In one of its initial tests, the plane crashed, killing 2 crew members, including the pilot. What was the antidote to this complexity that overwhelmed the best pilots? A checklist so they would not overlook any crucial item–a concept that is still used today. Checklists are usually very helpful (I’m glad they are used every time I fly), but they have their limitations. 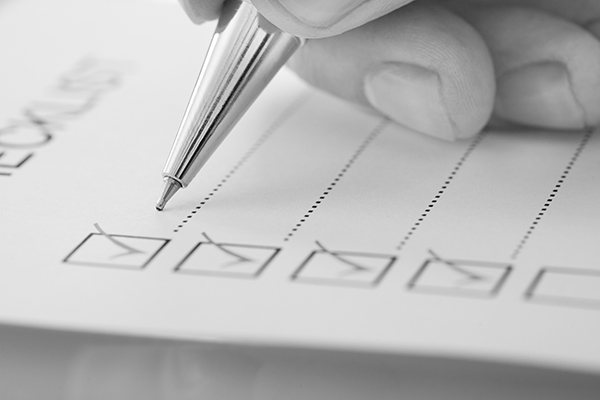 What are the best times to use a checklist, and when should they be avoided? Just like the complexity of a new, highly-advanced plane, checklists are useful–and even necessary–when the problem is so complex that even an expert in the field cannot be expected to remember every permutation possible. In areas where it isn’t complex, checklists can ensure that you don’t accidentally forget something. This is especially useful when there is a shortage of time or when training people who are not experts, like new employees. If a checklist is designed to ensure that no one makes a mistake, a poorly designed checklist does not accomplish that goal and in fact can lead people to making a disastrous choice. Like computer software, people assume established checklists work, and therefore don’t question their efficacy. If you use a checklist, be sure to reflect on the results you are seeing and adjust the checklist as needed. Don’t assume that the checklist is your best solution, but if it helps you through a complex task in your area of expertise or assists with jogging your memory when doing something more simple, use it. Just remember, like all decision processes, check your results and adjust your checklist when needed. The Misbehavin’ Fed Is Putting YOU At Risk!